The Charles Clinkard retail brand has been around for over 90 years, with Charles Clinkard and his wife opening the first store together in Middlesbrough back in 1924. The brand offers regular promotional codes and savings offers, so you can keep yourself and your family kitted out with the best shoes for less when you stick with vouchercloud. Since 1924, the company has grown enormously, and now has over 30 UK branches as well as its excellent online store, which stocks their full range of branded shoes and accessories at the same great prices as in their shops. The company is still family run, with the grandchildren of Charles Clinkard now at the helm. With fantastic brands like Converse, Gabor, Geox, Ugg, Start-Rite and Clarks, you can find all the best shoes, boots and trainers for men, women and kids at Charles Clinkard. It doesn't stop there with a grand accessories category stocked with hats, handbags, earmuffs and more too. Find your joy with Charles Clinkard - only bringing you the finest in footwear. Choose the Charles Clinkard deal you want to use from the range currently available here at vouchercloud. Click on the 'View Deal' button. If a code is needed to redeem the offer in question, it will appear now. You can copy this discount code by clicking the 'Copy Code' button, or just note it down. Add the shoes and accessories you want to buy to your shopping cart on the Charles Clinkard website. When it is time to confirm your order details and make your payment, paste in or type your Charles Clinkard discount code in the field provided to activate the offer! Some of these deals don't require a code, and you'll be informed of this when you click on 'View Deal'. In this situation, just shop normally on the Charles Clinkard site and discounts will be tallied up automatically where applicable. Check out the regular competitions that run on Charles Clinkard, this could be your ticket to some very exciting winnings! Yes Charles Clinkard is one of the few UK retailers which always offer free standard UK delivery, regardless of whether you spend over a certain amount or whether you purchase full price or sale items. While you can also opt for Express or Next Day Delivery for a small fee, if you want to get the best value then it can be worth allowing 3-5 days for standard delivery so you only pay for your shoes! Charles Clinkard also offers Click & Collect which allows you to pick up your order at any of their branches rather than having it delivered to your home when you shop online. This can be a very useful feature if you have a branch local to you and are not always at home to receive deliveries. This service, like standard UK delivery, is completely free of charge. Where is my nearest Charles Clinkard store? If you want to use click and collect or would like to check out some shoes in person, then you can use this store finder to see where your nearest Charles Clinkard branch is. What are the payment methods accepted at Charles Clinkard online? Standard Delivery is Free on All Orders - arrives within 4-7 working days. Express Delivery is available for £2.99 - arrives within 4-5 working days. Next Day Delivery is also available for £5.99 per item - order by 4pm. CollectPlus delivery is also free - and arrives within 4-7 working days (thought you'll be informed of the date of delivery). Click and Collect is also available, and is priced the same as standard delivery. Charles Clinkard do not offer free returns - however you can return items to any Charles Clinkard stores for free (find your local store here). Or print off a CollectPlus label and take your items to your nearest CollectPlus dropoff location. You can also reach Charles Clinkard online via their contact form. 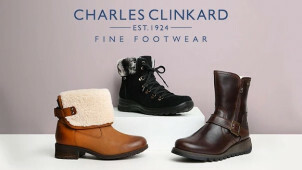 Charles Clinkard is a traditional UK footwear shop brand with a great selection of shoes for all the family. Including kids' shoes by brands like Lelli Kelli and Start-Rite, as well as fashionable adults shoe brands like Skechers and Vans - with a Charles Clinkard discount code from vouchercloud - you can get those renowned names in footwear that you are looking for with some significant savings too. Now buying shoes for the whole family is more affordable and rewarding so don't wait to check out Charles Clinkard both on the high street, and online! Charles Clinkard has its own loyalty scheme, allowing you to earn points when you shop shoes, and these can be converted into pounds to spend on your future buys! Joining the Charles Clinkard loyalty programme also gives you access to other benefits, such as early access to new collections and sales, and special competitions and deals. While Charles Clinkard is certainly a good one stop shop for all of your family's footwear needs, they also sell a great array of branded accessories. With bags, hats, scarves, gloves, socks and other useful accessories, all by the same great brands as their footwear - shop with a Charles Clinkard voucher code and save on Kipling, Barbour, Lotus, Puma and more. Here you can find all kinds of things to pair with your new Charles Clinkard shoes to help complete your outfits and kit yourself out for all weather conditions!